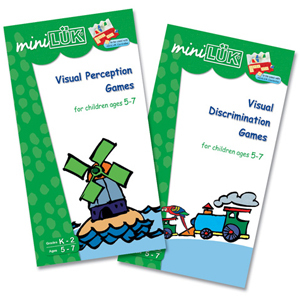 Visual perception provides the basic foundation for learning to read, to write and to do math. These two workbooks cover a broad range of visual perception skills: visual coordination, differentiation, discrimination, observation in detail, identifying alphabets and patterns, and basic mathematical skills. Visual discrimination and coordination, accurate observation, identifying alphabet letters, and basic math skills are the main focus in this workbook. It helps children build the foundation for reading, writing, and doing math. These activities are valuable exercises in the development of basic educational and intellectual growth for young children. Visual coordination and differentiation, accurate observation, number and pattern awareness, and basic math skills are the central focus in this workbook. It helps children build the foundation for reading, writing, and doing math. These exercises are valuable resources in the development of visual perception and general learning skills for young children.